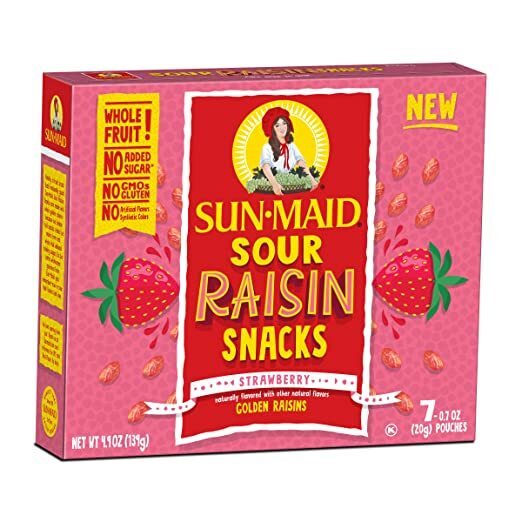 Since I began my no sugar diet about 5 years ago (right right I’m not perfect and maybe I should call it a YO YO diet, but I’m a lot healthier now than I used to be), I’ve been looking for great tasting, craving curbing snacks. I actually enjoy grocery shopping with my wife. I like to peruse the aisles for any new *No Added Sugar foods. Last week, I went to Albertsons. I have to say, I like Albertsons. Easy to get in and out of. My wife hates it. She says it is expensive. When you open up the package, it is a mini fruit roll up. Good, hard texture that makes it chewable and fun to eat. I use a toothpick after I eat it. Tastes great. Tastes just as good as fruit roll ups that add sugar. I eat it and I don’t need sugar anymore. That simple. 5 Star Sugar Craving Curbing Snack. These don’t taste like bland ol nasty raisins. These things are good and have a little punch to them. They liven up my oatmeal and are a great finger snack. I take them to Church on Sunday, because my kids don’t like them. No Added Sugar in bold. These are two great snacks to curb your sugar cravings. You should have them handy, especially in your first 10 days of quitting sugar. I have packages at home and at my office. I reach for them when a sugar craving hits hard.